This is the only entirely Malesian genus to emerge from Chirita. It occurs in Sumatra, Java, and Bali and has twelve species according to Olive Hilliard (2004). They are coarse perennial herbs of the forest floor. One species occurs in cultivation, the former Chirita asperifolia, now Liebigia speciosa. However, given that all species of this genus used to be lumped into Chirita asperifolia, it might be that there are more species being cultivated than is currently appreciated. 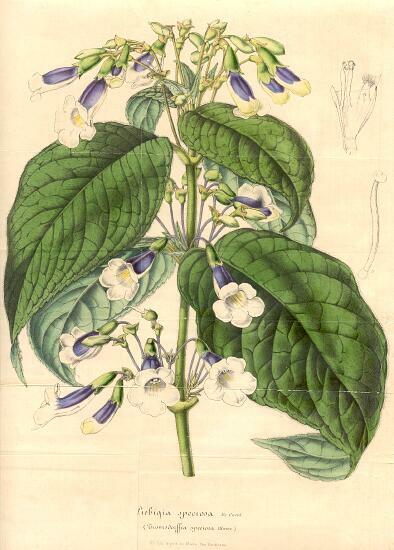 Originally known as Liebigia speciosa when published in Horto Van Houtteana (1847), this species was subsequently transferred to Chirita, and known for many years as Chirita asperifolia, before taking back its original name.